Pretty pictures reveal it all! Internet New Zealand is considering the possibility of introducing .nz domain names (as opposed to .co.nz and .net.nz etc). Based on simple observations, common logic and years of practice ‘smelling a rat’ I pronounce the entire exercise a con job, probably driven by a few people with a vested interest. In this conspiracy busting post I explain the patterns of behaviour that cause me to make this claim. First I declare my own interests here, in the .nz space I only own www.dennis.co.nz and www.denis.co.nz plus a couple of others for business purposes. I moved out of the Domaining business when I moved to Samoa and have only www.otago.org as one remaining investment (not associated with the .nz jurisdiction). I also have, as has been said, the rather dubious record of being the only .nz Registrar to be deregistered (an interesting story that like most things has two sides to it). Secondly I state that there are many good people working within the industry and the organisation, but I’m out of the country and have been pretty much out of contact even with my direct contacts in NZ. The claim of a con job relates to some people clearly passionate about this proposed change and their mischievous efforts to use a supposedly transparent and robust system to achieve their goals. Thirdly, my words are designed to enlighten, offering an opinion based on observations. If I’m wrong in my conclusions, then I’m happy to revisit them with delivery of more facts, but without answers to the key questions, I will likely stand behind the claims. In my first submission I basically claimed that there was insufficient reason to affect the change, and that justification for the change was rather annecdotal and lacked quality or objectivity. I hinted at an agenda by a few who wanted it, suggesting that the primary beneficiaries would be Internet New Zealand and the industry whose turnover would skyrocket as a result of the change occuring. Some high-powered advice came in in the first round of consultations suggesting much of what I said was sound business and common sense. My take is that much of the support was of a simple, follow-the-leader, tick-the-boxes format . Much of the opposition however was strongly opposed and very well reasoned. What they did in essence was to address many of the minor concerns, essentially tweaking the shape of the ship rather than questioning the need for the very existence of the ship, let alone where it was headed! I never bothered to submit a second time as I saw a second response as a waste of time talking to people with an agenda. I note too (and to Internet NZ’s great ‘shame’) that others to failed to spend time on their second responses, some just referring back to their first arguments. Great clues in conspiracy busting can be gained when dealing with conflict (or heated discussion). When key issues are ignored, brushed off lightly and assumptions that have been questionned are not validated. There still seem to be no compelling policy reasons for going ahead with the change, other than a desire to create more business for registrars. Ouch! Conspiracy? Perhaps . . . let’s read more from them. During the first round of submissions, many submitters raised serious concerns about the potential for cybersquatting, consumer confusion, and a lack of protection for intellectual property owners. These concerns are not adequately addressed in the amended policies. DNC has not offered any compelling reasons for introducing second-level domain names. Lookee here, now, Telecom is not the company I’m most endeared to but divining truth is very simple. If it looks like a duck, walks like a duck, and quacks like a duck – then it’s probably a duck. That Telecom is shooting live rounds like this means that Internet NZ has dropped the ball big-time; is hiding something or has an agenda. My call – an agenda, a conspiracy. We also cannot identify any material benefits from the proposal that would justify confusion – short term or otherwise. These guys care about this market sector. It is their passion and total focus. ANZA remains opposed to the proposal for which the benefits are relatively weak. Well actually, no they are not! Not for Internet NZ and the Registrars! Big bucks are looming on the horizon here. When working in the field of conspiracy busting one of the first questions to ask is quo bono (who benefits). The point here is that if there was no financial benefit to Internet NZ (for example they halved their prices across the board at the same time as introducing the new name options) then the thoughts that this whole scam was just designed to increase profits to the Registrars and Internet NZ would disappear. My guess is that the proponents of the proposal would pretty much all back off and go do other things with their time inside seven seconds flat if that was the case! Self-interest is a powerful motivator and a key clue as to who is doing what. Who gets the benefit? No This is a terribly misleading question. OUCH! Who let that cat out of the bag? None of the proposed changes to the initial draft policy make any difference to those issues raised in our earlier submissions. Again my point is not whether what AL Park recommend is good/bad (those cases can be discussed on their merits) it’s more the fact that the team HAS NOT ADDRESSED those concerns properly or fully. Clear evidence of an agenda. AJ Park would never in a month of Sundays say this, certainly publicly for their reputation is built on diplomacy and protecting clients’ rights. I can though, for my reputation is built on shooting straight and calling a spade a spade. For the record – there’s a clear agenda. Now to the biggie. You don’t ignore the Law Society when they call a concern with a conflict of interest, unless of course you’ve got an agenda! They use a lot of words to make their points, which are essentially – Internet NZ’s research is dodgy and they’ve got a conflict of interest. It’s worth a read if you’ve got time. Let’s call this one for what it is – an agenda, a conspiracy and a con-job. The Law Society believes the Revised Consultation Paper raises a number of issues that require further consideration, in relation to: . . . DNCL’s conflict of interest in undertaking the consultation and implementation of any registration scheme. Excuse me? What exactly did the top legal eagles say? This comment alone would put a shiver up my spine if I was in the driving seat of Inernet NZ! Proceed Internet NZ with this proposal based on your own self-interest, failure to address core issues as identified by top brains in the country and you’ll make the lawyers day! There’ll be lawsuits after lawsuits and you’ll have a whole bunch of VERY happy lawyers! 1. The New Zealand Law Society (Law Society) welcomes the opportunity to respond to the revised Domain Name Commission Limited (DNCL) consultation paper Proposed Registration of .NZ Domain Names at the Second Level (Round 2), May 2013 (Revised Consultation Paper). Why did not Internet NZ liaise with these guys and get some concensus FFS! Don’t they have their own hotshot lawyers on board? Where were they in all of this? Unless of course they didn’t want to because they knew they would get kicked out of the game park!  DNCL’s conflict of interest in undertaking the consultation and implementation of any registration scheme. 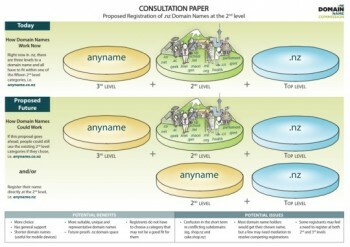 allow registration of .nz domain names at the second level. The Law Society’s particular concern was that the interests of trade mark owners may not have been adequately canvassed. Why did Internet NZ not undertake a proper canvassing and ignored the Law Society (and others like me) who called foul on the original research? Unless of course they had an agenda! 5. The Law Society submission asked for details of the public opinion surveys undertaken and a definition of “New Zealand’s Internet community”. The Revised Consultation Paper provides neither the details nor the definition requested, except to refer to a 2012 study “that exclusively targeted business owners”. 6. According to Statistics New Zealand figures, there were 469,120 New Zealand enterprises in February 2012.3 Many of these business enterprises will be trade mark owners, and will have an interest in the proposal to allow registration of .nz domain names at the second level. 7. Neither the original consultation paper nor the Revised Consultation Paper indicates that the views of this group have been canvassed. Nor has sufficient detail been provided as to who comprised the “business owners” said to be targeted in the 2012 survey. 8. The Law Society therefore remains concerned that DNCL continues to base its consultation and recommendations on surveys that are not representative of all the relevant New Zealand public. 9. The Law Society raised concerns in its previous submission that the negative impact on trade mark owners of the proposed scheme for registration of .nz domain names at the second level may not have been adequately considered. 10. The Revised Consultation Paper reports that 115 submissions were received in relation to the initial Consultation Paper, of which 37 (32%) submissions were in favour of the initial proposal, 70 (63%) submissions were against, and 6 (5%) submissions commented on only some of the details. To the extent the 115 submissions received may be regarded as constituting a poll, a majority of submitters was therefore against the proposal. An own goal there eh?! 11. In addition, the Revised Consultation Paper reports that a major concern expressed against the proposal was that existing domain name registrants would feel “forced” under the new system to incur costs in registering domain names they do not wish to use. In response, DNCL proposes that existing domain name registrants will be able to reserve registration of the equivalent to their current name at the second level for two years. However, the DNCL proposal would only defer the cost of registration, and applies only to existing domain name registrants and does not include existing trade mark owners, and therefore does not adequately protect either group. “… it does not support the private ownership of domain names such as .lawyer.nz, .law.nz, .lawsociety.nz, .legal.nz, or related variations that represent the legal profession. This is because the ownership of such domain names potentially gives rise to regulatory and consumer protection concerns as outlined below. A lawyer must not engage in conduct that is misleading or deceptive or likely to mislead or deceive anyone on any aspect of the lawyer’s practice. 13. The DNCL stands to increase its revenue significantly from extra registrations under the proposed scheme. The Law Society is therefore concerned that the DNCL has a conflict of interest in undertaking this consultation and implementing the proposed registration scheme. 14. In this context, it is particularly important that special care is taken to ensure the views of all the relevant New Zealand public have been sampled and considered, and that all potentially adverse effects have been appropriately mitigated – rather than simply deferring the adverse effects for one relatively small group of domain name registration owners, as is currently proposed. Good common sense. Something that people with agendas tend to lack. 15. The Law Society reiterates its previous recommendation that a New Zealand version of the existing Trademark Clearinghouse should be established. This would provide trade mark owners with the option of registering their trade marks as a domain name (the Clearinghouse “Sunrise Service”) or using their rights to prevent others registering their trade mark as domain names (the “Trademark Claims Service”). The New Zealand Clearinghouse would similarly protect existing domain name registrants. 16. Further information regarding the Trademark Clearinghouse regime generally is available at www.trademark-clearinghouse.com. 17. This submission was prepared with the assistance of the Law Society’s Intellectual Property Law Committee. If you would like to discuss the submission, please contact the convenor of the Intellectual Property Law Committee, Clive Elliott, through the Committee Secretary, Jason Cooper: (04) 4632967 or jason.cooper@lawsociety.org.nz. Well done Chris and the team at the IP Law Committee. Sorry to say this, but as a rule I don’t trust you guys as far as I could kick you but I think that you’ve really nailed your legal points very well in your submission here! Very professional. I call the whole exercise a con. I predict that the proposal will NOT go ahead based on the belief that there are smart people within Internet NZ and the risk/cost analysis will not favour Internet NZ. No doubt they will find the whole proposal exercise highly beneficial to the industry and justify it somehow, with the proponents rewarded with some cushy job, opportunity or contract and big smiles all round. It should have been killed off after the first round of consultations with some integrity – just called a dumb idea. Ten years ago sure, yes maybe, but in 2013 – nah! I might be wrong and it gets through. Woe to the NZ business community if it does and top marks to those with the agenda for swinging their swindle then if it does! [It’s a mistake to] transfer our respect for hard science, math, physics, biology, engineering, etc., where it is deserved, to the soft sciences, like history, economics, psychology, sociology, etc., where it manifestly isn’t.